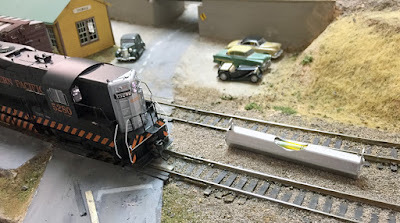 I have written several posts about making and using removable loads for open-top cars, both bulk materials like coal, ore and sand, and then also materials like pipe and lumber, that have to be restrained by spacers and stakes. And then there are various kinds of crates and other packages which can be interesting loads. These previous posts are readily found by using the search term “open-top cars” in the search box at right. In the present post, I want to show a few more examples of different kinds of these loads. 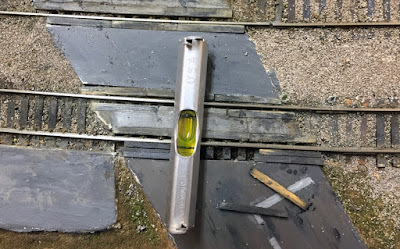 I have mentioned pipe loads in several earlier posts, including showing how I make most of them from drinking straws or coffee stirrers (see, for example, this post: http://modelingthesp.blogspot.com/2012/01/open-car-loads-pipe-in-gondolas.html ). I have deliberately arranged these various loads with different kinds of stake restraints, following prototype photos, with some additional guidance from the AAR Loading Rules booklets. (Either I don’t fully understand those rules — certainly possible — or else those rules were not always obeyed). Here is an example of another of these pipe loads, also made from plastic straws. The gondola, SP 160185, is a Tangent model of SP Class G-70-12 which, having been built in 1953, the year I model, is portrayed as almost clean. As I have mentioned in previous posts, there are some good commercial loads that can either be used as-is, or modified to fit particular cars. Shown below is a Chooch molded load depicting coils of wire. It did not fit into this gondola, and had to be cut and trimmed so that it would work. 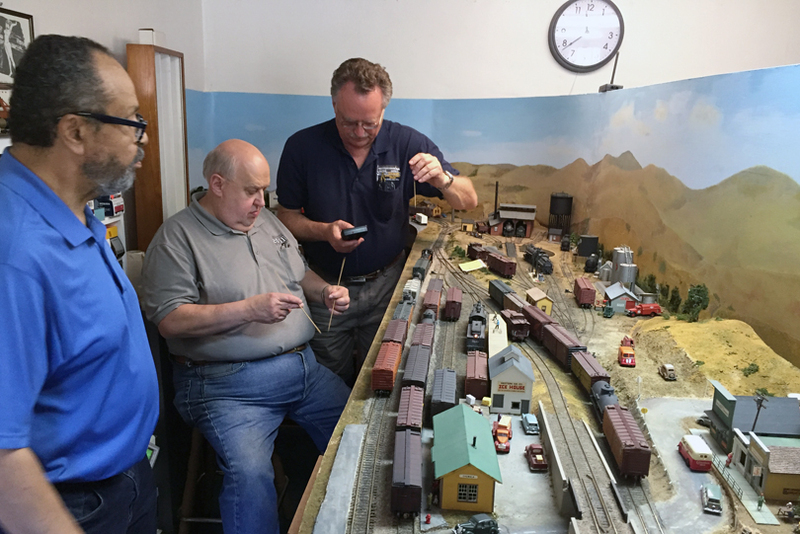 It is seen here in Reading 25034, a re-detailed USRA gondola from Walthers, modeling Reading class GML. Another example of a commercial load, modified to fit some of my freight cars, is this cable reel set, though I have owned it for so long I no longer remember the manufacturer. Here the gondola, NYC 707698, is again a re-detailed Walthers USRA steel gondola. 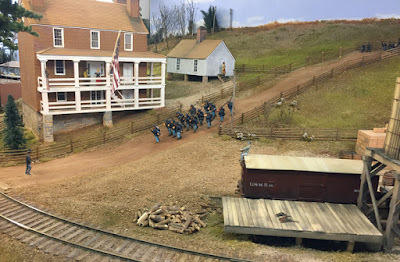 I have shown girder loads before in this blog, and continue to enjoy them as excellent examples of loads the railroads were (in the transition era) uniquely equipped to carry. I have made a couple of such loads by kitbashing Atlas bridge girders, and recently adopted one such load for a 65-foot mill gondola. The bracing is one of the arrangements shown in the AAR Loading Rules. Such a load has no reasonable destination on my layout, but instead moves in mainline trains that simply pass by on the SP Coast Route. The gondola, a model of PRR Class G26, is built from an E&B Valley kit. You may note that the car’s top chord has some bends and dents, as was common in mill gondolas; these were accomplished with gentle use of a warm soldering iron. Sometimes upright girders like the one shown above were more extensively braced. Richard Hendrickson built such a set of bracing for one of his loads that I inherited, as you see below. It is a girder from a Central Valley bridge kit. 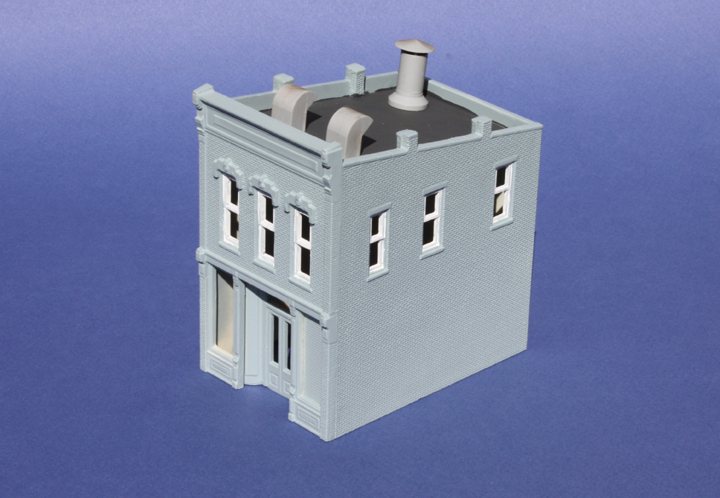 This gondola, CRP 89065, is a Precision Scale brass model. The CRP was a Central of New Jersey subsidiary. Lastly, I will show a pair of crates, made to ride on a flat car. They are marked for Lucifer Furnaces, a company in Pennsylvania. 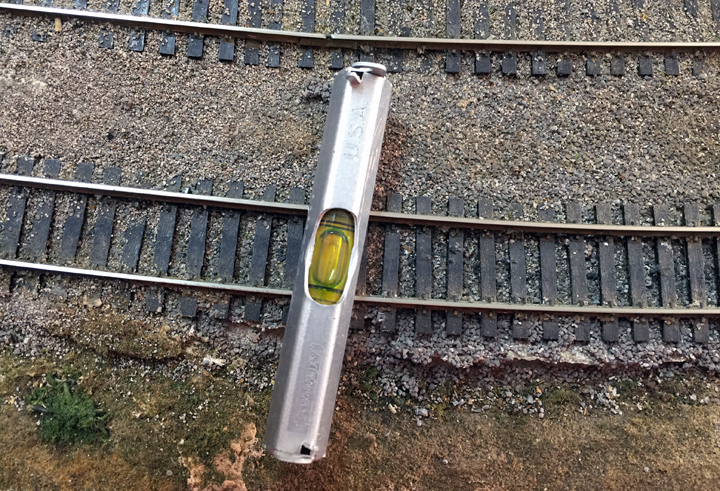 The flat car is an upgraded Athearn 40-footer, with new Tuttle sill steps, wire grab irons, and a vertical-staff handbrake. You can click to enlarge the image. All these loads are part of the variety I like to include in my open-top cars. 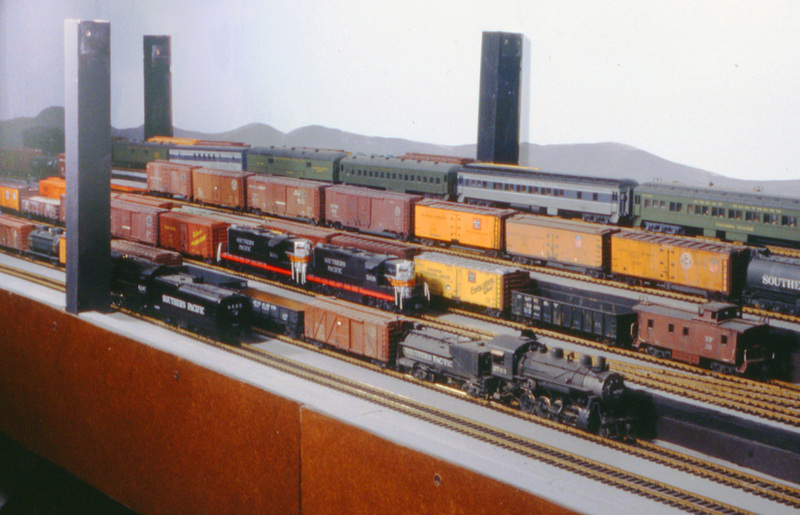 In the transition era, which I model, there was such a preponderance of house cars that these visible loads make a nice change from the remainder of most trains. I have written numerous posts about waybills for model operation, and also a number of posts about how the prototype managed waybills back in the transition era. 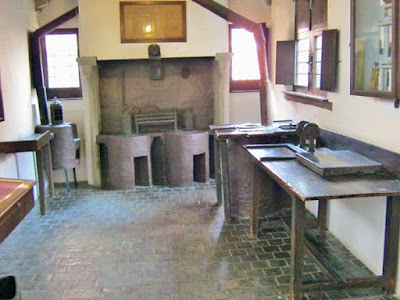 In the present post, I want to add some interesting information about waybill offices, including the substantial numbers of clerks needed back in the pre-computer age. 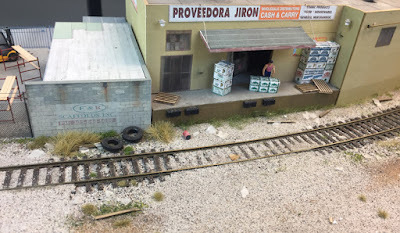 My examples are for Southern Pacific. The traditional yard office operation on most railroads involved lots of pigeon holes for waybills, and groups of clerks passing waybills from hand to hand, both to capture needed information and to re-file them to direct further car movements. Moreover, each group of clerks had a different function. The record-keeping for demurrage was separate from per-diem charges; inbound waybills were handled separately from outbound ones; a clerk was needed to track diversions; manifest or time-sensitive freight was handled separately; specialty movements such as Pacific Fruit Express (PFE) had a separate clerk; and so on. This made a complex paper-handling problem in a large office. 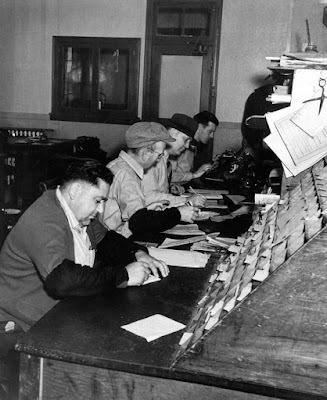 The photo above shows a group of yard clerks, one of the groups just described, working with a large rack of pigeon holes for bills, in the office at Taylor Yard, Los Angeles. The most interesting part of this photo is the identifications of the clerks. Given in the caption for this image were the following: Standing, left to right: B.W. Mitchell, superintendent, Los Angeles Division; L. Mayrisch, manager, FPM&SS ( Freight Protection, Merchandise & Station Service); G.J. Matt, terminal superintendent, Los Angeles; and T.F. Marlowe, chief yard clerk. [Note that the three senior management people are wearing their fedoras, an unmistakable sign of SP management in those days.] Seated around the table, clockwise from front, are: J.C. Girard (arm over chair) and M. Neinbaugh, in-desk clerks (that is, inbound waybills); G. Williams, PFE clerk; F.D. McArthur, photo clerk; L.H. Meyer, H.R. Murdock, and L.W. Altizer, out-desk clerks (that is, outbound waybills); and G.S. Flanagan, assistant chief clerk. 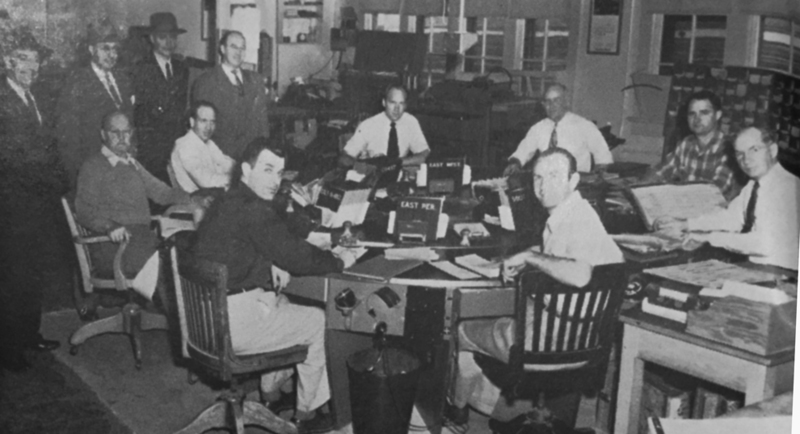 But shown in the photo above, of course, is only the staff for the round-table operation. Also part of the office force in this one office was an entire additional group of clerks and other employees, pictured in a separate photo, and again, the identity of the many jobs involved is the real interest. This image, also in the yard office, clearly shows that just about everyone who worked there was pictured, including the janitors. Here the identifications of individuals are as follows: at the left-hand desks, front to rear, are: G.M. Boyd, assistant service clerk; M.L. Brown, service clerk; P.V. Noller, assistant chief yard clerk; and F. Gifford, per diem clerk. Standing at rear are G. Osborne and P. Boyd, janitors. 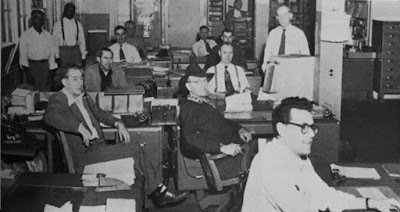 At the right row of desks, from from to rear, are: H. Smoller, steno-clerk; W.A. Pringle and M.W. Anderson, assistant service clerks; M.R. Heinbaugh, report clerk; and D.K. Farrar, assistant service clerk. Standing, at right, are G.S. Flanagan, assistant chief yard clerk, and (at far rear) T. F. Hayes, train clerk. Though I don’t know exactly what all the job titles mean, it is obvious that there were quite a lot of people managing all the paperwork connected with waybills. And a majority of them are wearing dress shirts (probably white) and ties in both photos, another sign of those times. 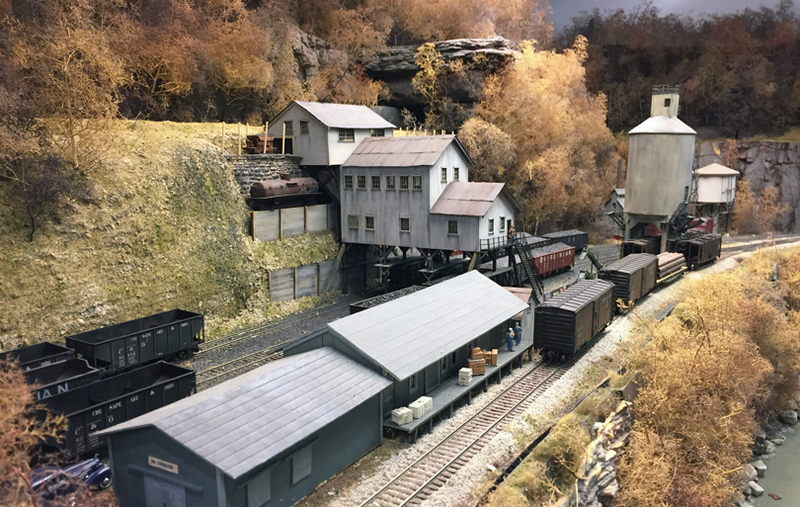 We modelers sometimes grumble about handling “paperwork” during layout operation, but I would submit that most of us have little or no conception of what the paperwork was actually like,“back in the day.” This SP Bulletin article offers us just the merest glimpse of the waybill side of railroading in that era. I have occasionally conducted operating sessions on my layout with the use of the prototype timetable, a document included in the timetable offered to layout operators (I showed how this was developed and implemented in one of my columns in Model Railroad Hobbyist, the issue for October 2014 [you can read on-line, or download, this or any issue of MRH at any time, for free, at their website, www.mrhmag.com ], if you are interested.) In the past, I have included that timetable in op sessions by making the layout time the same as “actual” time, in other words, people could use their wristwatches or cell phones to see the time, or else I asked them to use those sources, but to subtract or add some number of hours — that one is really too clunky to believe I tried it — but I did — once. However, now that I have a fast clock, as I described in a recent post (it’s at: http://modelingthesp.blogspot.com/2018/05/fast-clocks-part-2.html ), I can simply set the starting time for a session to the time I want. That’s what I did on a weekend earlier this month. One of the days we only had a crew of three, who divided up the work as it seemed best. In the photo below at Shumala, that’s Otis McGee at left, Ray deBlieck at center, and Ed Slintak at right. The latter two are figuring out how to exchange the power on the returning Santa Rosalia local, whereupon Otis will take over switching at Shumala. 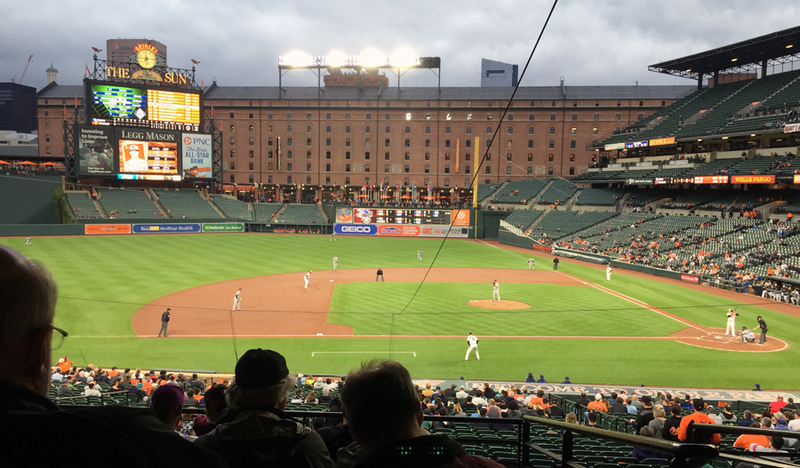 That’s the fast clock at upper right. 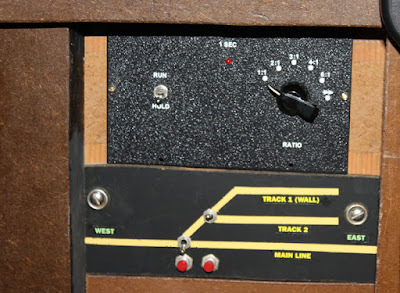 They found the fast clock fit perfectly into the session. The next day we had a more normal four-person crew, and ran pretty much the same session, based on the morning hours of the timetable (though “actual time” was afternoon). The starting crew at Ballard with the first Santa Rosalia local comprised Steve Van Meter (left) and Seth Neumann (right). 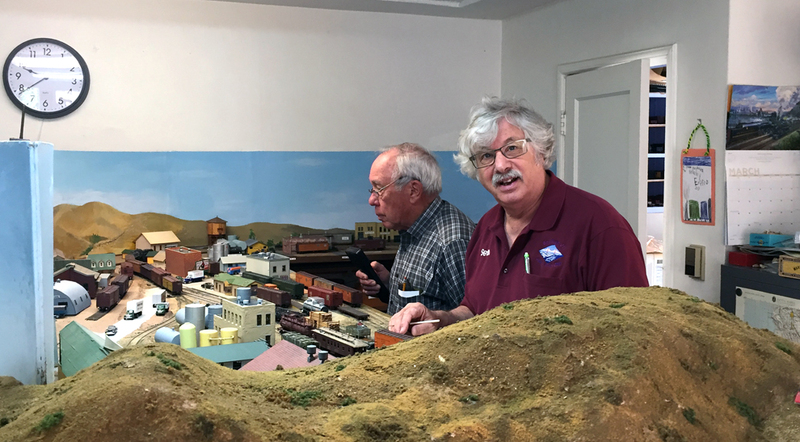 Meanwhile, the other crew, shown below, comprised Richard Brennan (left) and Jim Radkey (right), who finished their work at Shumala, then took over the second run of the Santa Rosalia local. They are shown figuring out the next move at Ballard. 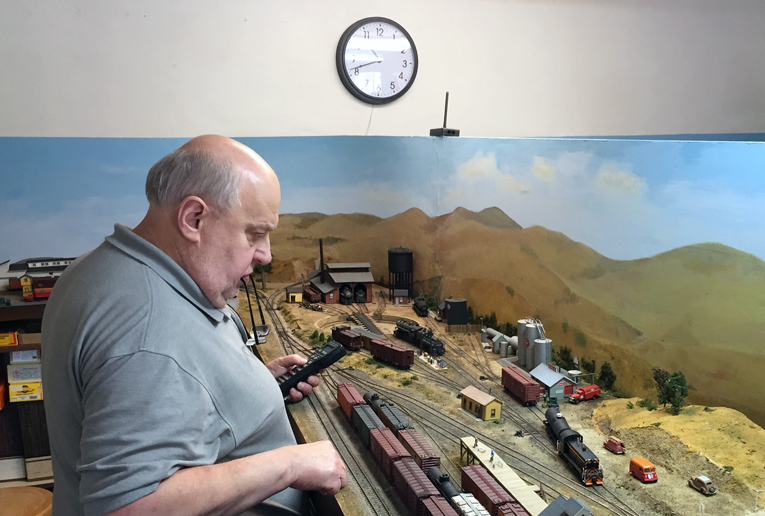 I was happy how the clock worked out in directing the work of the session, and it was also fun to be able to operate some mainline trains according to the timetable. For example, here is Train 914, the scheduled morning through freight, passing Shumala, behind Mikado 3251. This session worked as I wanted it to, and the “fast” clock, at 1:1, did mesh perfectly with the timetable already on hand. This was yet another step in bringing operation of my layout closer to my overall goals. In Part 1, I gave some general background of the 50-foot express reefers operated by Pacific Fruit Express (PFE); you can view that post, if you wish, at this link: http://modelingthesp.blogspot.com/2018/03/pfe-express-refrigerators.html . 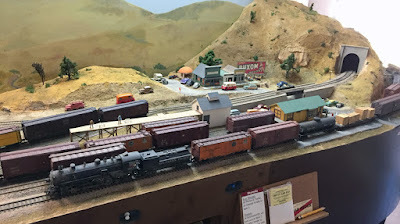 In the present post, I want to comment on improving the Walthers reefer, shown in the post just cited, along with some other comments on express cars. If one were to set out to “fix” the Walthers model of an express reefer, ice hatch platforms have to be added for any era after the early 1930s. 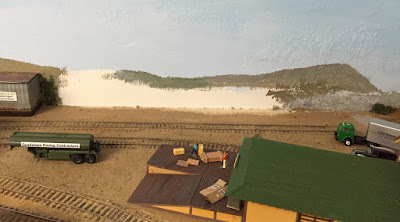 This would involve removing the Walthers ice hatches, and then building new platforms, and replacing the hatches. I haven’t done that to my Walthers model (and may not, as explained below). Here is how it should look, with an Athearn reefer which has been corrected (though not by me). The new platforms are not horizontal but would certainly be more secure to work on than the curved roof. 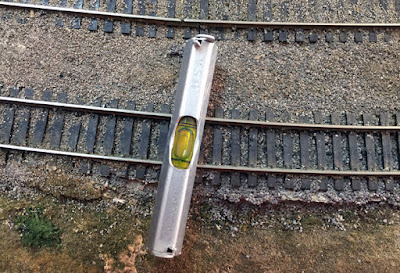 Note here that the Athearn end has been sanded smooth in the upper part, and boards re-scribed, before a new, curved fascia was applied. This does give the right overall look. I said I may not do work like this on the Walthers model I own, at least not any time soon. Why? Because I own some really nice brass ones. some of which I received in exchange for having helped with prototype information prior to the production of the cars. 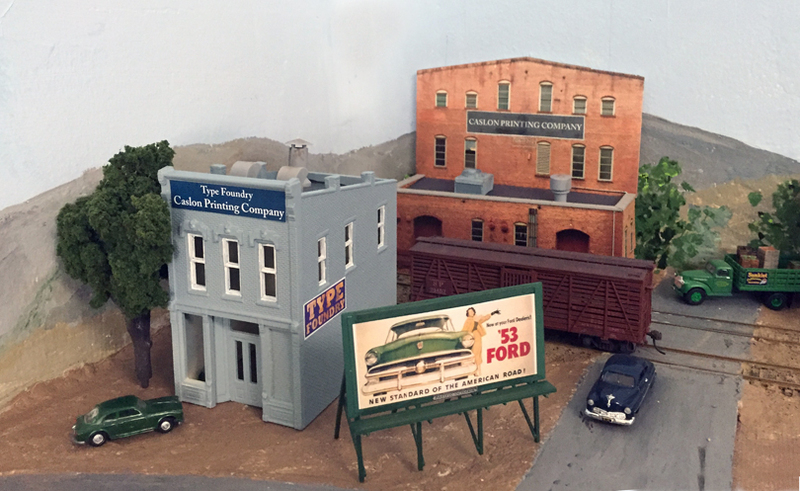 Those nice models, done in HO scale brass of the 50-foot express cars, were produced around 30 years ago, by WP Car Corp. Shown below is one of these cars. It has no car number; WP Car included number decals in the box so the owner could choose a number. But no end lettering was supplied. I will add that from Champ sets I have. The car duplicates the appearance of PFE 50-foot express reefers from 1929 to 1954, and is thus suitable for my 1953 layout. In addition to those cars, more recently Challenger Imports also did this car. The Challenger model I have is especially nicely detailed, though its roof is painted the same Dark Olive Green as the sides. Lettering drawings for these cars clearly call out black roofs. That information is in the excellent reference book by Jeff Cauthen and John Signor (Southern Pacific Painting and Lettering Guide: Locomotives and Passenger Cars, SP Historical & Technical Society, Upland, CA, 2013, but notice that that book does not include the black side hardware noted in my previous post (for a citation, see the first paragraph of the present post). For more on the history of these cars, you may of course consult the PFE book (Thompson, Church and Jones, Pacific Fruit Express, 2nd edition, Signature Press, Berkeley and Wilton, 2000). I could always operate this car under a mild, one-year time warp, but have no present plans to do so. One reason for the PFE rebuilding is that in the early 1950s, PFE’s fleet of express reefers had deteriorated considerably, and starting in 1954, most began to be rebuilt. As a stopgap, PFE also reassigned 50 freight reefers, 40 feet long, for express use (a bit like what was done in the pre-1920 period!). They chose cars from Class R-40-10, and I’ve discussed those cars, and the modeling of them, in some earlier posts (the first post in the series is here: http://modelingthesp.blogspot.com/2016/02/pfes-40-foot-express-reefers.html ). After completing the modeling of the Chrysler trucks used on 25 of the cars, courtesy of Ross Dando’s snubber castings, I showed a finished car (see it at: http://modelingthesp.blogspot.com/2016/03/pfe-40-foot-express-cars-part-3.html ). An important point for modelers to remember, in planning operation of express reefers, is that a number of owners of such cars placed them in a pool operated by the Railway Express Agency (REA). That meant that cars owned by a particular railroad might roam widely in REA service, and an Atlantic Coast Line car might show up in California, just as a Santa Fe reefer could be seen in Georgia. 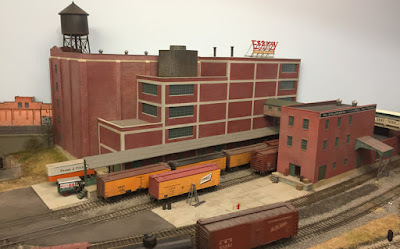 I described how this pool worked, and showed a table of the contributing railroads, in a prior post (you can see it at: http://modelingthesp.blogspot.com/2015/01/express-refrigerator-cars.html ). But since the REA pool cars were only in a cooperative operating agreement, not a lease or sale, the original owners remained responsible for all but minor repairs. That in turn meant that each owner’s cars tended to be operated in its home territory, just for reasonable access to shops. 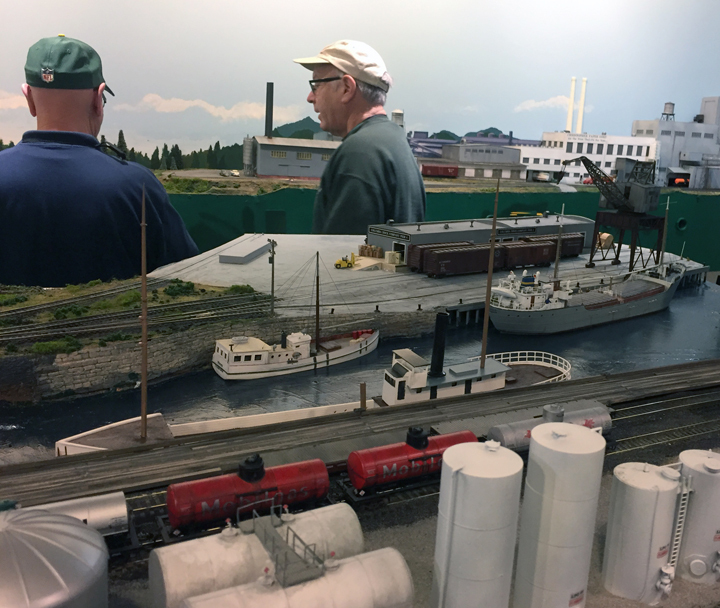 My view of that situation is that I would be reluctant to operate, say, that Atlantic Coast Line express reefer on my California-locale layout, while a Great Northern car would seem more reasonable (both were in the REA pool). My own operating sessions, when particular fruit crops are first harvested and thus command high prices justifying use of express reefers, rely on both PFE express cars, and also very importantly on REX cars (REA contributed over 1600 of the 2500 cars in the 1953 express reefer pool). I also use a few other Western roads (Milwaukee, Great Northern; GN had the second biggest non-REA fleet in the REA pool). In addition, I have a very nice brass model of an NP express car and may include that in my fleet one day. I enjoy the opportunity to include express reefers in my packing house operations, and am still working to balance my express fleet to my satisfaction. 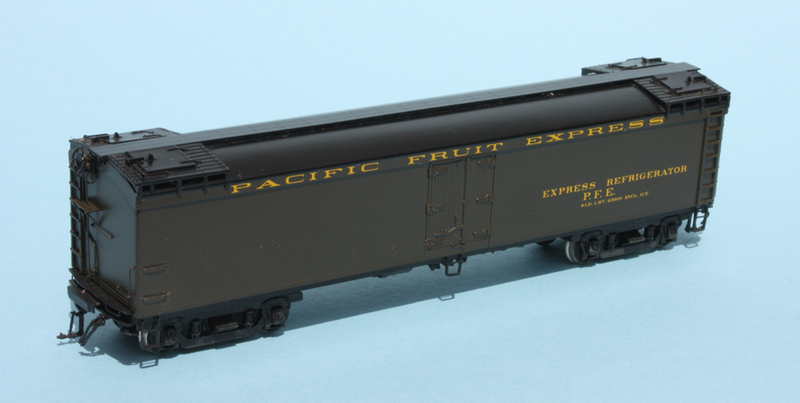 Express reefers are an interesting option for almost any layout in the transition era. 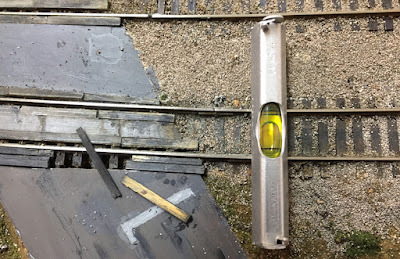 In the first part of this report, I described a distinct sag in a part of the main line trackwork on my layout, a segment of track that had been in place no less than 30 years on a piece of my original layout. (You can read that post at: http://modelingthesp.blogspot.com/2018/05/fixing-sags-in-track.html .) As I summarized in that report, I managed to raise and level the track over the majority of the sag. But further checking showed that I had not actually corrected all of it. I showed in that first part my use of a string level to check that both rails of my track were at the same level. That was fine in the track area I showed in that post. But the adjoining road crossing, of Chamisal Road in my layout town of Shumala, was not level in that sense. The rails were level along their long axis, but the rail tops were not level with each other. I had to remove some of the planks in the crossing, and use a small screwdriver to pry up the track until it was level. As I suppose is obvious, the rails were built slightly above the surface of the crossing and the road, in order that track cleaning can proceed without interfering with the crossing itself. This slight out-of-level was opposite to what is present within the road crossing, so it had to be adjusted. With everything looking good as to level, line and gauge, it was time to try a persnickety locomotive over the track. Years ago, I liked to use a ten-coupled steam locomotive for this task, as one of my Westside engines was very picky about operating over track with the slightest deficiency. This is annoying, of course, in ordinary circumstances, but is quite welcome when checking track. If that engine runs over the track, you can be sure the track is up to standard. But today my most picky engine is a Broadway Limited diesel with three-axle trucks. It is a lovely model and runs really well, but simply doesn’t like track that isn’t correctly aligned. So I pulled out that engine and ran it back and forth over the corrected track, both with and without a train, and it ran fine. With all these tests passed, this track sag demon can be classified as conquered. There are a couple of lesser sags in a couple of my industrial spurs, so I am not done with this kind of work, but it was nice to get the main line back up to standard. If you have any sags on your layout, these ideas may work for you. I know that some people, reading this topic title, will think, “Build the track right in the first place, and it won’t develop sags.” They are right. But that isn’t my topic. I’m talking instead about sags that develop over time. Again, I am not talking about soft or poorly supported areas that show sags. I refer to areas built atop the same plywood and Homasote used everywhere else, but nevertheless, a sag has developed in just a few local areas. In my case, these sags have developed in trackage that has been in place for 30 years or so, and as I said, the adjoining trackage is fine. That shouldn’t happen, you are thinking, and so was I. But as Jim Providenza has reminded me several times, what “shouldn’t happen” to layout track really does happen. Jim would probably add, “Get used to it.” But the real point is not why it happened. The problem is, the sags have developed, and short of pulling up the whole area of track and completely re-laying it, what can you do? This of course would be abuse of a good chisel, a tool with quite different uses. But this particular chisel is old and worn, so I don’t think I was abusing it beyond its condition. 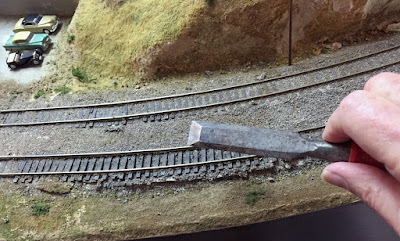 This is the area just (railroad) west of Shumala on my layout, and is a good illustration of the problem; the inside track just two inches away, is fine, with no sags. Only the outside track needed fixing. 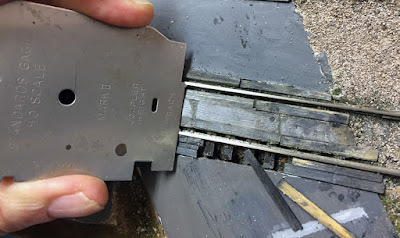 It seemed to me I could wiggle the chisel under the track and raise it. This kind of works. 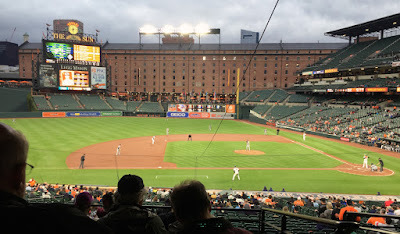 It certainly raised the track, but raised it in a way that is not entirely all right; it raised the outside rail quite a bit more than the inside rail. 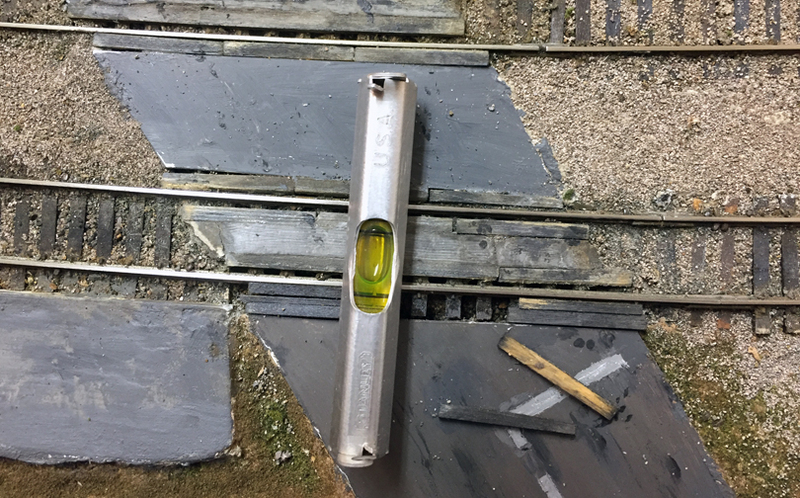 So I went back and used the chisel judiciously on the other side or inside of the offending track, and as expected, it was soon raised enough for the track to have the two rails at a comparable level. But of course “comparable” isn’t good enough. I have a small level I use in situations like this, and with its help, shimmed track where necessary to get rails fully level over the whole stretch being repaired. This level is the kind masons use when checking an alignment string (thus the hooks). Once I had the track corrected to my satisfaction, the next step was to fill all the voids with ballast and make the track look like the rest of the track in the area. Years ago I mixed a medium gray and dark gray ballast product together to get the kind of variation that real ballast has (it is rarely as uniform a color as a package of model ballast would produce). I use a soft brush to adjust and distribute and contour my ballast. Once this is complete, my remaining technique is pretty standard. I mist the area with “wet water” until I’m sure it has penetrated, then use an eye dropper with dilute matte medium. I find matte medium superior to white glue for this purpose. 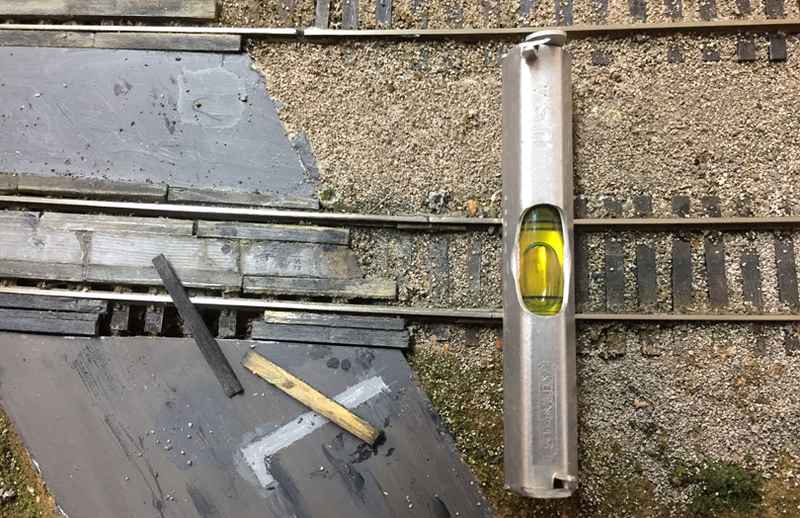 With these steps complete, the sag is all but gone, track is level both parallel and perpendicular to the rails, and track gauge has been checked throughout. This idea of using a chisel under the track to raise it definitely did work, and I will likely try the same on other sags around the layout. Recently I happen to have had conversations with several people about simple backdrop techniques, especially the use of highly simplified skylines. I think this is something important to recognize. Let me show a couple of illustrations of what I mean. First, a thoroughly historical example. What struck me so forcefully at the time was how effective this “hill profile” was. Obviously no actual landscape painting has been achieved here, and certainly no detail can be discerned, because there isn’t any. My guess was that our brains are accustomed to “reading” this kind of dim profile as meaning something far away. Thus we immediately “know” that this simple, undulating gray stripe represents hills or mountains in the distance. Another person needing a simple skyline was Brian Moore in Plymouth, England. Brian models Guadalupe, actually quite close to the location of my Santa Rosalia. (For an illustration of his modeling at an earlier period, you might enjoy watching this YouTube video: https://www.youtube.com/watch?v=KVHmgBT2T-Q ). His layout view is inland, toward hills and mountains of the Coast Range. He chose to make a very simple grayish skyline, as you see here. Note that he added abut a four-inch strip of green to suggest the fields in fact located east of Guadalupe, and a few trees. Brian says he used ordinary poster paint for this, and the trees are just blobs, but here again, our brain “knows” that these green blobs are distant trees. The point I want to make here is that for many backdrops, you don’t need to be an artist to paint it yourself. In fact, an artist’s lovely painting might be a mistake. Remember, it’s a backdrop, meant to support the foreground modeling, not a beautiful scene in itself that distracts attention from the foreground. That’s why simple versions like these work so well. 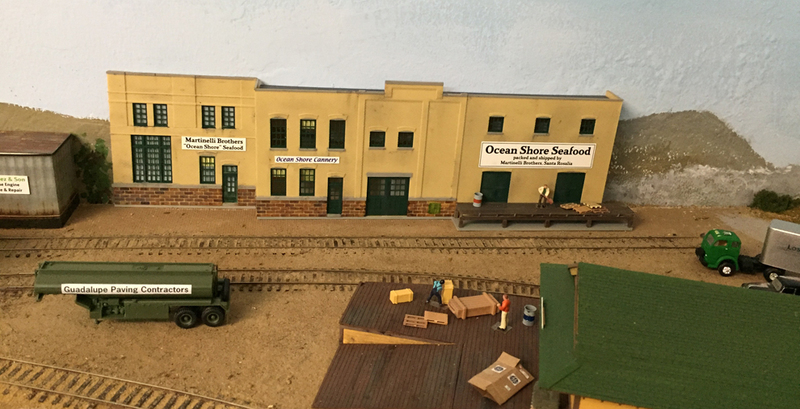 There has long been a challenge for modelers of Southern Pacific passenger equipment, and that is to reproduce the color commonly known as “Dark Olive Green” or DOG. 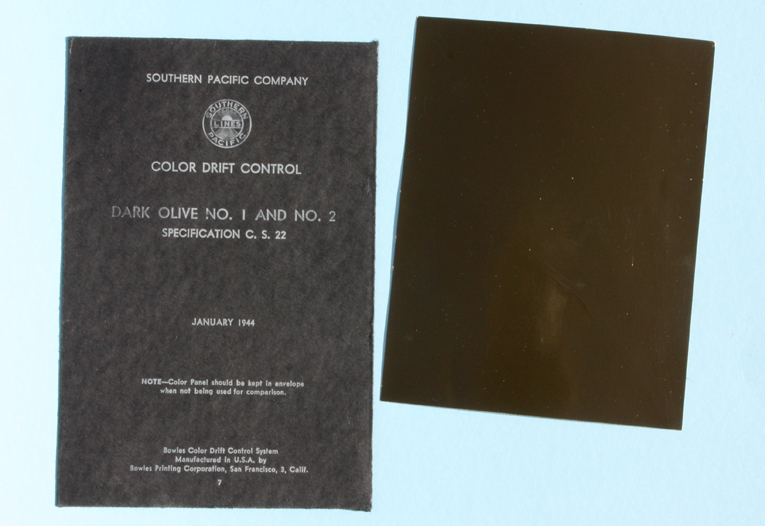 The actual SP color drift panel for this, which happens to be Common Standard Color #1, is called “Dark Olive,” and the “green” part is added for clarity. I happen to have one of these drift panels, so can compare various model paints to the SP drift panel. Below I show a photo of the drift panel black envelope, and next to it, the drift panel itself, photographed in full sun. You may note the panel is shorter than the envelope length. Some years ago, I cut off a strip to loan to a brass importer (which shall remain unnamed) and never got it back. Nowadays I would not be willing to share information in that way. I have shown this envelope and its drift panel before, though in that case it was a scanned image, not like the photograph above, taken in sunshine. But the previous post does have some commentary congruent with my present discussion (you can see it at: http://modelingthesp.blogspot.com/2012/11/modeling-sp-passenger-cars-coast-mail.html ). It is in any event obvious how dark this color is, though how dark the image looks to you will depend on how dark your room is right now. How can we best match it? There are two parts to any answer. The first part is to find a model paint that matches the drift panel shown above. As it turns out, the military Olive Drab paint colors (in some versions) are very much like the SP color, and so are some versions of Great Northern Empire Builder green. But paints come and go, and some of the paints once recommended for DOG, such as Polly S (Floquil) “Olive Drab,” their no. 500850, FS 33070, is at best hard to find today. 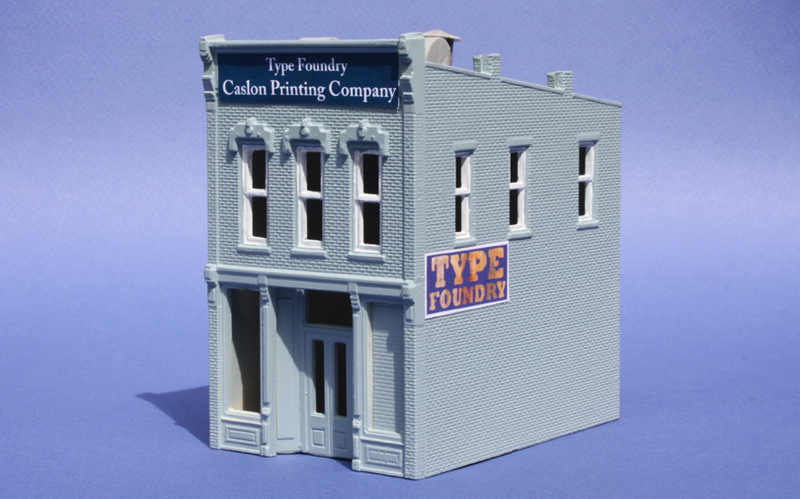 The same goes for some of the Badger Modelflex colors, such as their “GN Green,” no. 16-65, though there is a pretty good Modelflex military color, “Olive Drab,” no. 16-96, FS 34097. Of the two, I think the FS 33070 is better. I should mention that in this post, I am only discussing a particular paint color, not entire paint schemes. For the latter, there is no better reference that the book by Jeff Cauthen and John Signor (Southern Pacific Painting and Lettering Guide: Locomotives and Passenger Cars, SP Historical & Technical Society, Upland, CA, 2013). 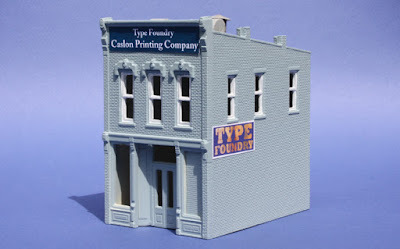 I am sometimes asked how one should compare model paints, prototype paints, etc. I have airbrushed model paints onto white card or white styrene to serve as something to match to an SP drift panel. I usually match model paints to the SP color drifts in indoor light, since that is where my models will live, but in most cases when I have repeated the experiment outdoors, the indoor good matches remain good, and the less good indoor matches remain inferior. I said there were two parts to the answer about matching DOG. The second part has to do with modeling with light levels below daylight levels. However you choose a starting point for a model color (from the discussion above), all these colors are quite dark. Color photos of SP equipment painted DOG usually looks considerably lighter than what that DOG color presents in indoor lighting. Shown below is a Bruce Heard photo, taken at Fresno in July 1958 in full sun. You will note that the car color looks a lot lighter than the drift panel shown at the top of this page, though it is clean and glossy, certainly not badly faded in service. This photo appears in Volume 1, on coaches and chair cars, from the SPH&TS series, Southern Pacific Passenger Cars, (SPH&TS, Pasadena, 2003) on page 254. 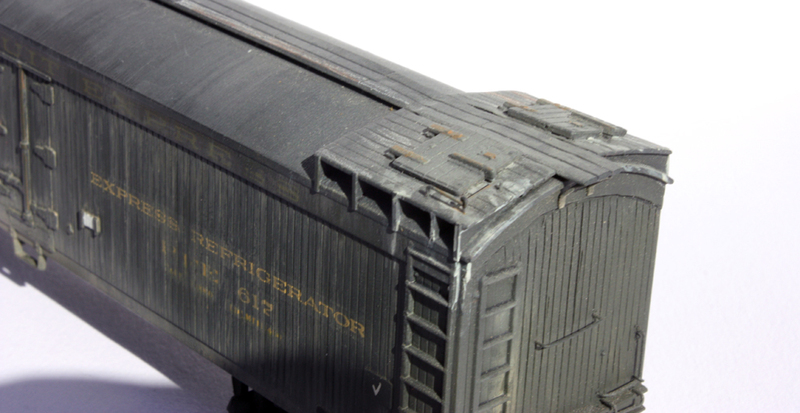 Modelers have commented on some of my SP passenger car colors, that they seem light. That is true, and entirely deliberate. 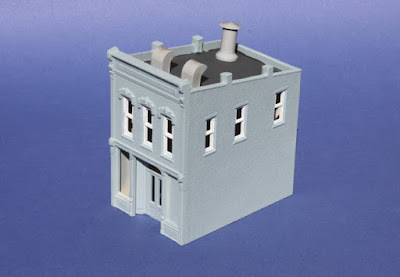 (for examples, see this post: http://modelingthesp.blogspot.com/2018/02/my-pullman-projects-part-2.html ). 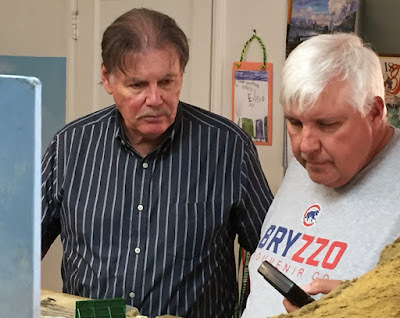 I want my models to look like the Bruce Heard photo above, even though my layout room doesn’t have Fresno-intensity July sunlight in it. Now we enter the realm of what you want to see in a color. I plead guilty to lightening the color of most of my SP passenger equipment, so it looks less like the drift panel and more like the Bruce Heard photo. Of course, as the saying goes, your mileage may vary. Shown below is one of my AHM Pullman conversions, discussed in a prior series of posts (you can access them by using the term “Pullman” in the search box at the top right of this blog post). It is a conventional 12-1 (12 sections, 1 drawing room), with air conditioning ducts added and its name, Tuolumne, chosen from the roster of heavyweight sleepers SP purchased from Pullman in 1948. This color doesn’t really match the Bruce Heard photo above, but it is headed in that direction. Incidentally, true Pullman Green is definitely not the same as the SP’s DOG. To my eye, Pullman green is darker and lacks the olive tone, comprising yellows and browns, that is visible in DOG. And as would be expected, paints such as Scalecoat Pullman Green do not match the SP drift panel at all. The point here is that you should not substitute Pullman Green for DOG. This particular color discussion, centered on SP’s DOG, can stand for any number of dark prototype colors that we modelers have to “duplicate” in indoor lighting. It’s a value judgement by each of us, not science or engineering, and probably best seen as a question of Art. As an engineer myself, that seems “wrong” at first, but I have learned to understand and accept it. This is just one more example of a set of modeling paths among which we all have to choose.